Want to run Windows 3.1 on your iPhone? I sure don’t, but hey just the fact that you can pull it off is neat right? With a jailbroken iPhone, some patience, and an immense desire to punish your iPhone, you can actually manage to run Windows 3.1 on the iPhone, and apparently it runs well (as well as Windows 3.1 can run, I imagine). Yes, this means Minesweeper and Notepad.exe in all of their lack of retro glory, running on your nice new iOS device. First things first: Grab the greenpois0n or limera1n download to jailbreak your iPhone if you haven’t already. You’ll then have to find your own copy of Windows 3.1 (maybe from your local BBS via a 9600 baud modem?) to use in the installation. First off, add the Cydia source: http://www.litchie.net/cydia to your list of sources, under the “Manage” tab within Cydia. Then locate and install DosPad Beta (1.92 is the latest). Create an additional folder named “w31” on /var/mobile/, which is where Windows will be installed. Now you’re ready for the fun stuff. Open up DosPad and type “mount –u c”, which will unmount your C drive. Then type “mount c ~/w31”, which mounts your C drive to that empty folder we created earlier. Do that again, this time for the A drive, by typing “mount a ~/winsetup”. This mounts all of those loose installation files in the winsetup folder to the A drive, as if you had the installation disks inserted into your virtual floppy drive. Type “a:” to change the directory to the A drive. Then type “setup”, and your installation of Windows 3.1 should begin! Run through the installation, which takes about 15 minutes. When finished, you’ll be asked to reboot your machine. Simple exit DosPad and clear it from your Multitask bar. Relaunch it, and type “mount –u c”, “mount c ~/w31”, “c:” and “cd WINDOWS”. Finally, type a simple and victorious “win” and hit enter. Welcome to Windows 3.1. This might be the single worst idea to ever come to the iPhone, which is probably why it’s so fun. 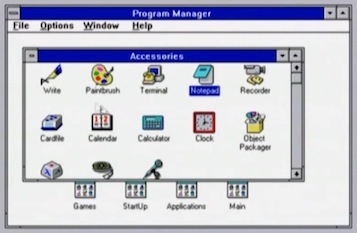 I honestly can not think of worse operating system than Windows 3.1, everything about it was awkward, clunky, confusing, and generally pretty miserable to work with. That’s pretty much the opposite of iOS. Me? I’ll stick with iOS. If I was going to run an alternate OS though, I’d probably opt to install Android on the iPhone. I’d say from your ‘review’ that you’ve never really followed the route IBM-PC’s have taken over the year. While Win3.1 is horrible compared to the current state of things, it was quite well received back in day. Heck, it was the first usable graphical shell that was commonly accepted on the IBM-PC platform. And it was usable. You could multi-task, not fantastically, but you could. So before just shooting down a graphical shell (because – Win31 is a *graphical shell*, not an OS), please check it’s background. And don’t compare it to current standards, that’s comparing apples and alligators. you could have explained all of it with out the mud slinging. I am so tired of ‘I’m better than you because my interface is pink, oh wait, that was last month, it’s blue, you need to upgrade!! Come on, let those who want do without all the ridicule! !My mother used to sing this song to us as kids and when I grew up, I realized what she was doing and then I got pissed. ‘I can do anything better than you, I can do anything that you can do!’ Maybe my Mother is responsible for all the landfill that is ruining our home.